MILFORD, Mass. – As the clock was winding down, the desperation to find an equalizing goal ratcheted up from the stands to the fans lining the fence behind the Milford bench to the players, coaches, and alumni on the sidelines to the players trying to make it happen on the pitch. Every move to create space was met with a roar, every perceived Walpole infraction met with arms thrown into the air and calls for a whistle, and every time the ball went into the box the cheering turned from words (in several languages) into a single, unintelligible sound trying to will the ball into the back of the net. Unfortunately for the Hawks, every one of the chances that they created in a frenetic final 20 minutes on Wednesday night in the Div. 2 South quarterfinal was cleared, blocked, saved, or just trickled wide and Walpole’s second half penalty kick held up as the winner. The Rebels, who eliminated Oliver Ames in the first round, advanced to the sectional semifinal with a 1-0 victory. After an evenly-matched opening half, which saw Milford have a goal called back for offsides, Walpole started the second half brightly, putting the Hawks on their heels and pinning Milford back on the edge of its own penalty area. Alex Maclean was peppering the Milford back line with a succession of long throws that forced center backs Tiago Filadelfo and Joao Boaventura to constantly be on their toes. The Hawks took 14 minutes of the second half before creating anything of note going forward and it was a long-range effort by Jordan Borges that was comfortably saved. Walpole answered right back with a great chance of its own, but Tom Walsh blazed over the bar from only a few yards out. In the 57th minute, Milford nearly grabbed the lead. Boaventura played the ball out of the back to Leo Coelho, who managed to get a toe on the ball and redirected it into the path of JJoey Madden making one of many forays down the right wing. Madden got all the way to the end line and cut it back to Walisson de Oliveira but the junior couldn’t generate enough power and his first-time shot was saved. Three minutes later, the Rebels got on the board. Another long throw came in but was allowed to bounce in the penalty area, with the ball striking the hand of Joao Vitor Neiva. The officials deemed it enough to call a handball and a penalty. Aidan Murray got Josh Orellana to go the wrong way and knocked in his shot from the spot to make it 1-0. The majority of the time remaining would be spent in the attacking third for Milford, as Walpole sat deeper and deeper, defending in numbers, to protect its advantage. de Oliveira, the team’s leading scorer and one of the top scorers in the Hock this season, fashioned a chance with skillful footwork in the box but the Walpole defense charged it down and blocked the shot. In the 70th minute, Anthony Salvador drove into the box from the left and he went to ground under a challenge that the officials ruled was fair. 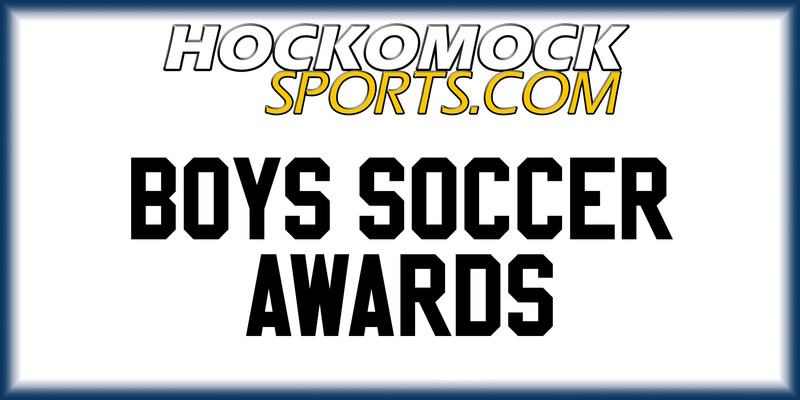 The ball rolled into the path of Lucas Da Silva but his shot through traffic was well-saved by Walpole keeper Dennis Crowley. A minute later and it was Dan Santos that found himself with room to try a shot. His left-footed effort got through the crowd of players in front but was cleared off the line at full stretch by Sebastian Pignone. Three minutes later, Salvador worked enough space to get off a shot but it was deflected and easily grabbed by Crowley. A long throw by Madden reached de Oliveira but his header went just wide of the post. in the 80th minute, as the Walpole bench was pleading for a clearance and/or the final whistle, another Madden throw caused a panic in the box. Several Milford players got a touch and the ball seemed to pinball off everyone’s legs before rolling inches wide of the bottom corner. It would be the game’s final chance. The whistle sounded and the Davenport division champions dropped to the ground in disbelief. Milford (13-2-5) won the program’s first Hockomock League title this fall, so there was plenty to celebrate, but on this night there was only the feeling that the Hawks season ended prematurely. “These guys have done more than any Milford team in the last two decades, so of course I’m extremely proud of them but we felt like we could do a lot more,” said Edwards. He added, “I’m sure the guys who are coming back are going to use this as motivation because they’re going to feel very angry with how this game was decided. MILFORD, Mass. 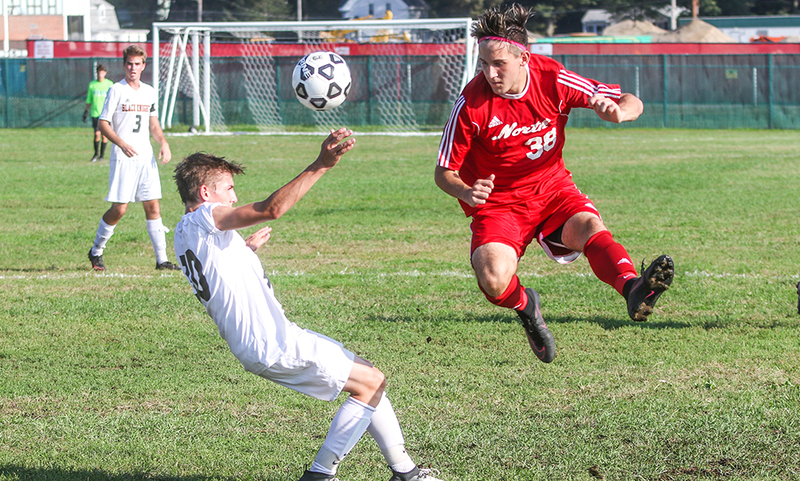 – Heading into Thursday evening’s matchup with Canton, the Milford boys soccer team needed just one point to clinch at least a share of its first Davenport division title. But that’s not what head coach Brian Edwards told his team. Edwards told his team it was a must-win in order to become Davenport champions. “We didn’t want to share,” Edwards said. His team responded, using a goal in the final five minutes to earn a dramatic 3-2 win over the visiting Bulldogs. It marks Milford’s first ever Hockomock Davenport division title, and the program’s first league title since 1999 when it won the Mid-Wach A crown. It was only fitting that the game had a dramatic ending after it was filled with goal scoring chances, terrific saves, solid defense, and timely goals. The build-up started just before midfield at the beginning of the 77th minute with junior Jordan Borges electing to keep possession instead of forcing anything up field. He found sophomore Leo Coelho on the right flank, and Coelho quickly switched fields to senior Tiago Carvalho. Carvalho slid a pass back up the middle to Borges, who used a deft touch with the outside of his right foot to get free from a defender. The junior took a touch towards goal and ripped a hard, dipping shot that found the side netting on the far post for a 3-2 lead in the final moments of the game. “It was a great ball, my teammates put me in a great spot and I just happened to finish it,” Borges said. “Everybody has their chances on this team, we play together as a team, this was my chance. When I hit it, I knew right away when it came off my foot, it was pretty sweet. It was Borges’ third goal of the season, giving him seven points on the season. The final goal was the fifth of the second half alone. The teams played a scoreless 40 minutes to begin the game before the fireworks began in the second half. It took Canton less than five minutes into the second half to get on the scoreboard. Senior Paolo Ruggeri drew a foul on the left flank and senior Paul Corcoran stood over ready to deliver a cross. Corcoran whipped in a service but the ball eluded a pair of Canton runners. 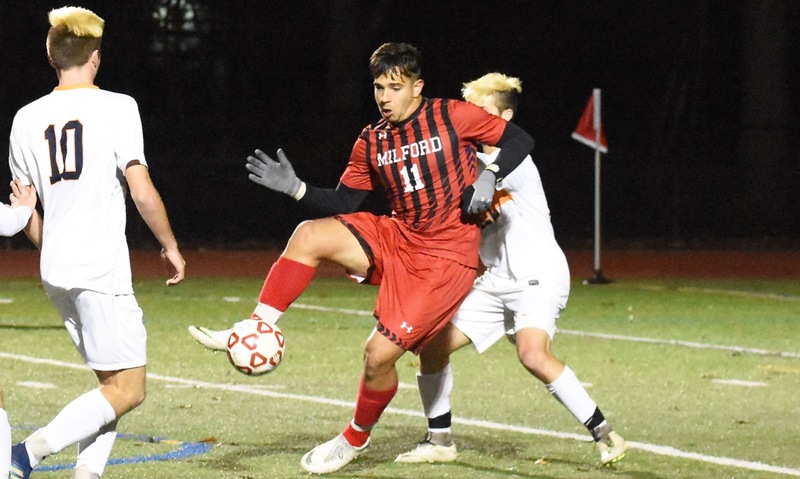 However, it was enough to freeze Milford keeper Josh Orellana (eight saves) and the ball hit off the far post and in for a 1-0 lead in the 44th minute. Canton saw its advantage evaporate just minutes later as the Hawks pulled even with an immediate response. In the 46th minute, senior Joey Madden used a long throw-in into the area and the Canton clearance was knocked down by Joao Vitor Neiva. The block went right to the feet of sophomore Lucas Da Silva all alone at the far post and he blasted his shot in for make it 1-1. The chances continued for both sides as Ruggeri saw his shot go just over the bar in the 48th, and Borges had a header saved in the 50th minute. Back on the other end, Griffin Roach latched onto a long throw from Corcoran behind a defender, made a nice move by another Scarlet Hawk, and ripped a low shot that was turned aside by Orellana. The rebound fell right back to Roach and he put hit his shot into the what appeared to be an open goal but Da Silva positioned himself perfectly on the goal line and cleared it away to keep the game level. Milford capitalized on the goal line stop three minutes later to take its first lead of the game. After a nice combination from Walisson de Oliveira and Neiva, the latter was dispossessed by a nice tackle from Avery Minkin atop the area. Before Canton could clear, de Oliveira jumped onto the ball, raced to the end line and played a low cross back into the area and Neiva slid in-between a trio of Canton defenders to tap it in at the near post. Similar to how Milford erased Canton’s lead in moments, the Bulldogs returned the favor by tying the game just two minutes later. Again it was a long throw from Corcoran that got things started. His throw was knocked down in the area right to the foot of senior Simon Cruz and he quickly one-timed a shot just inside the post to make it 2-2. The next scoring chance was Borges’ game-winner in the 77th minute. While the first half didn’t have any scoring, it wasn’t for a lack of chances. The first half had just as many scoring opportunities as the second half, and even saw Canton find the back of the net only for a whistle to take it off the board. In the 19th minute, Cruz latched onto a loose ball and looked to play Roach in. Cruz was taken down on the play and as Roach turned and hit a shot that found the back of the net, the ref whistled for a foul on the play against Cruz. Canton nearly scored on the ensuing free kick as well. Roach ripped his shot over the wall but Orellana came up with a key one-handed stop to keep it out. “First off, hats to Milford for winning the Davenport, they deserve it,” said longtime Canton head coach Danny Erickson. “They are a great team and they are a real dangerous team, I’m real impressed with them. Having said that, I thought we played really well in the first half. I thought we dominated the entire half and I was really disappointed that we scored a goal that really would have made a difference and the referee had blown the whistle early. It happens, ref’s are fallible, it happens. That goal would have a big difference for us. But Milford put us under a lot of pressure the last 15 minutes of the game and they deserve to win that game. I’m real proud of my kids. We didn’t lose the Davenport today, we lost it over the last couple of weeks when we didn’t get some of the results we needed. Milford raced down the other end and nearly opened the scoring. After beating a couple of defenders, de Oliveira’s shot was blocked by a slide from Corcoran. 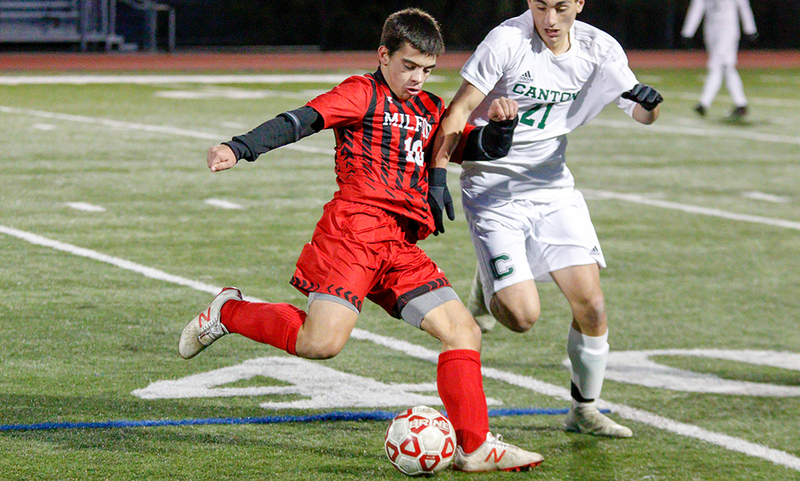 The ball popped into the air and de Oliveira was first there, getting a head that went over the keeper but Canton senior Mike Mazzola covered perfectly, heading the chance off the line and out. In the 33rd minute, the Bulldogs had a pair of great chances, again starting with a free kick from road. Roach drilled a dipping shot from 30 yards out that forced a low save from Orellana. The rebound fell to the feet of Alejandro Correal and he put a good shot on goal but Orellana got up and made a spectacular sprawling effort to get in the way to keep the shot out. Milford’s two best chances of the first half came in the final five minutes. Coeleho linked up with de Oliveira in the area but the junior’s header glanced just wide in the 36th minute. And in the final minute of the half, de Oliveira worked his way past a pair of Canton defenders before playing Neiva in alone. Neiva was forced a touch wide by keeper Dylan Coyne and sophomore Matt Giglio recovered to block the shot. Milford boys soccer (10-1-5 overall, 9-1-5 Hockomock) returns to action on Friday against non-league rival Hopedale, and finishes the season on Monday at Stoughton. Canton (9-4-4, 8-4-3) closes the regular season out on Saturday against Foxboro.